Demolishing a building will require many different types of heavy equipment. If you have never done this before, you may be astounded at how many types of machinery are actually needed. The use of excavators, backhoe loaders, and bulldozers is quite common. Depending upon the size of the structure that you are taking down, it may also require a very large crane with a boom using a wrecking ball that can begin the process. There are also legal and safety related aspects of this process which must be part of the planning, ensuring that the entire project is completed without any incident at all. 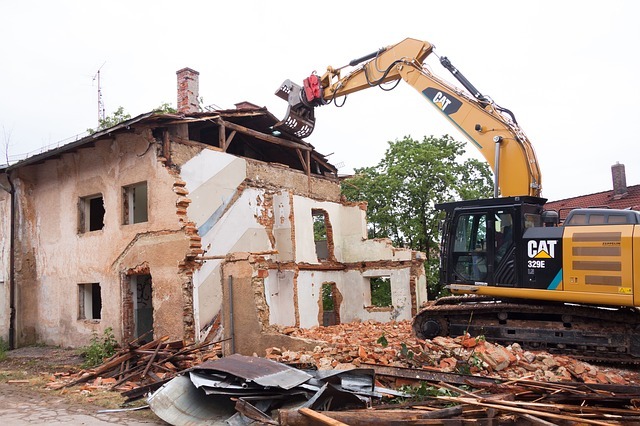 Here is an overview of how the process works for residential buildings demolition. There is a certain sequence of events that must transpire before the building is ultimately demolished. It will begin by ascertaining how it will be done in conjunction with surrounding structures. People will need to be alerted to the fact that a building is being demolished and proper permits must be obtained. In the meantime, those that are planning the demolition project will need to coordinate crews of individuals that have done this before. Renting heavy equipment such as cranes, bulldozers, and loaders will be necessary. You must also have a local municipal solid waste company bring in large bins where the rubble will be placed and subsequently processed. Once all of that has been prepared, and the building demolition permits have been granted, the demolishing of the building can begin. What If This Is Happening In A Residential Area? If this is occurring in a residential area, great care must be taken to not affect those that are surrounding the building that is going to be taken down. Alerts must be provided for the people that are adjacent to the building, and signs must be put up to indicate that a demolition project is going on. In most cases, if this is on a street, that street will be blocked off for public safety. Pedestrians and vehicles will not be allowed to drive in that area. In many cases, the demolition process can take several weeks depending upon the size of the building that they are going to knock down. Once the process is complete, all of the machinery will be returned. The workers will be dispatch to the next job. Though rubble will be recycled, to the best of the ability of the municipal solid waste company that is in charge of that aspect of the project. In many cases, they can repurpose the concrete that was removed as a result of the demolition, along with the rebar which will be melted down and used for future projects. Whenever you are involved with residential buildings demolition projects, you should know that you must have everything planned out in advance so as to improve the safety of those in the community and to avoid any legalities that may be involved if you do not have approval from the city where the demolition is going to take place.